Many of us are faced with the “morning dash,” that mad race to get ready for work, the kids, or a home-based business. For me, I need a cup or two of coffee before I begin my race. We also have more than one coffee drinker in our household, and we operate on different schedules. So rather than make one pot of coffee, we need the option of brewing one cup when we want, to our liking. 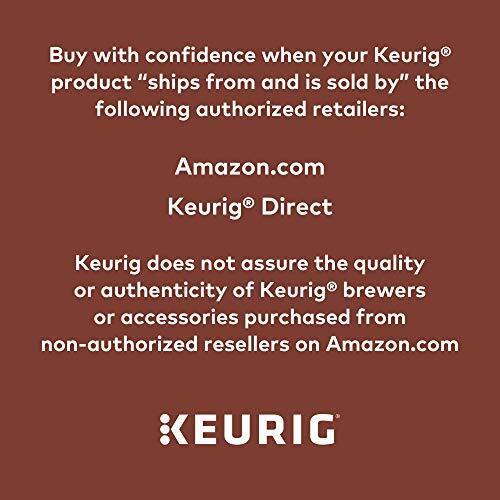 While there are many Keurig models to choose from, the Keurig K475 seems like it might be the ideal choice for us because it brews a cup of coffee in less than one minute, brewed the way you like, and makes it easy to operate without having to fuss with grinding beans or measuring ground coffee. But does it work as good as implied? Here’s what you can expect if you opt for the K475. First off, the K475 is very adaptable, which is great if you’re a fussy coffee drinker, or you have different tastes in your household. There are five brew sizes to make a cup of coffee with K-cup pods (4, 6, 8, 10 and 12-ounce sizes) as well as a strength control setting. This means you can choose any size of cup and make it bold with the touch of a button. It also brews K-Mug pods, which gives you the option of 12 and 16-ounce mugs. A bonus is that the drip tray is easy to remove so that a travel mug can fit under the spout. There is the option to purchase a Keurig carafe (sold separately) and K-Carafe pods if you need more coffee at once. The K475 will brew 22, 26 or 30-ounce carafes. There is an auto brew setting that can only be used with the carafe. You can also enjoy hot water only, by opening and closing the brewer handle without placing a pod in the machine. The K475 has five temperature settings, giving you the unique ability to choose different temperatures for your beverage. It has a large (2 and a half inch) colored touch screen. It features a digital clock, and you can program it to turn on and off at set times, so that you don’t have to wait for it to warm up in the morning, and can conserve energy when your coffee drinking is done for the day. It brews a cup of coffee in under a minute! As long as you have the timer set to warm the pot before you wake up, you can be enjoying coffee 60 seconds after waking. It also has a large, 70-ounce water reservoir. This reservoir can save you time because you can make 8 or more cups before having to refill it. It’s also removable so that you can easily refill it when necessary. The K475 comes with a water filter handle and two filters that promise to improve the taste of your coffee and other beverages. It included 6 K-Cup pods so that you can try it right out of the box. The brewer itself has the removable reservoir, removable drip tray, and the digital color touchscreen. If brewing a pot of coffee is something you want to be able to do, you can purchase a 32-ounce stainless steel carafe separately. This allows you to brew and dispense 4 cups of coffee at once. The thermal carafe is double-walled and vacuum-insulated and works in conjunction with the K475 brewer. 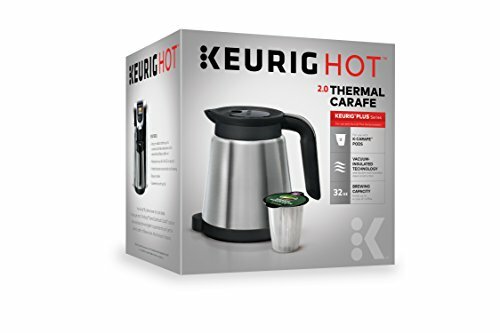 It is sold as a Keurig 2.0 Thermal Carafe. You can also purchase a reusable “pod” or filter, marketed as a Keurig 2.0 My K-Cup Reusable Ground Coffee Filter. This allows you to buy ground coffee and re-use the pod, rather than buying K-cup pods. I like the programming. The machine can turn the brewer on before your alarm goes off so that the machine is heated and ready to go. It then can be programmed to turn off late in the morning when you won’t be having more coffee, to conserve energy. If you want an afternoon coffee, it’s easy to turn on and use. I also like the favorites setting, which can store my preferred brew size, whether I want the “strong” option, and my preferred temperature. I don’t have to mess around with the settings every time. I don’t like the size. The pot is taller than many coffee pots, at 13.2 inches high, and 17.6 inches high when open. If you plan on storing the K475 in your cupboard, it might be difficult to move to your countertop if you are unable to handle its 10-pound weight. While there is an option to make pots of coffee, the carafe has to be purchased separately. The fact it only brews 4 cups may not be ideal for those who regularly host larger crowds or like to drink a full pot of coffee. Who Is The K475 For? I think the Keurig K475 is ideal for people who don’t drink large amounts of coffee. It’s also great for households where there is more than one coffee drinker, with different schedules and different tastes. Each person can brew a coffee to their liking, rather than having a pot of coffee sit and get stale. You can even choose different types and flavors of coffee for each member of the house. If the carafe is purchased, it provides flexibility, with the ability to brew a small pot of coffee for gatherings, or make a pot on the weekend and brew your coffee once before relaxing for the morning. It’s also great for people who are used to the Keurig system. This brewer is a step up from the original, basic one-cup Keurigs, but is an easy adjustment from those to the increased bells and whistles of this brewer. If you hate the idea of disposable pods, or filling reusable pods, or drink a lot of coffee, then a traditional coffee maker is likely a better choice. How long does it take to brew a cup of coffee? It takes less than a minute if the machine is pre-heated and you have a K-cup pod ready. Of course, brewing a carafe will take longer. How tall is the brewer? It is 13.2 inches high, and 17.6 inches high when open. It is 10.5 inches wide and 13.3 inches deep and weighs 10 pounds. Does a travel mug fit under the brewer? You can use a travel mug with this machine once the drip tray is removed. However, if you have a taller mug, it may not fit. What type of pods does it use? This is a 2.0 model, so it uses 2.0 pods or the reusable 2.0 pods. Does the Keurig K475 have the option for a direct water line into the reservoir? No. 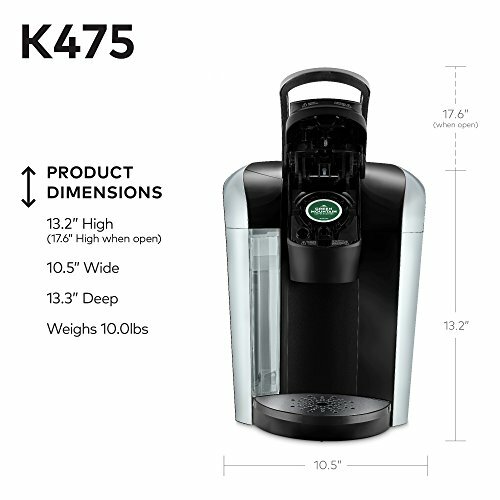 The K-475 has a 70-ounce water reservoir that can make 8 or more cups (depending on the size chosen) before having to refill it. It is removable for filling. I don’t like the fact that the reusable pods are sold separately, and are different for this brewer than other Keurigs. In this environmental age, when we are all becoming more aware of the damage we are doing to the environment, I think the brewer should come with at least one reusable pod. Some people will not like having to either choose between a disposable pod or stand and fill a reusable pod each time you want a cup of coffee. If you have to fill the pod, that cuts in to preparation time. I think the digital display and multiple settings can be a bit overwhelming at first. If you’re used to just making coffee, all the choices may be a bit frustrating until you check the manual and work through the settings. Of course all types of coffee makers run in to problems. Check out our Keurig Troubleshooting guide for common problems and fixes. The Ninja Coffee Bar has gained in popularity and offers more options for brewing than the Keurig. This also means a bigger coffee maker, geared for those who want specialty brews like espresso. Nespresso has marketed their coffee brewers quite heavily, so it’s another well-known system. Nespresso uses “capsules” instead of pods and has coffee makers geared to either coffee or espresso. You can brew a cup of coffee quickly and to your liking. Others can brew a cup the way they like. 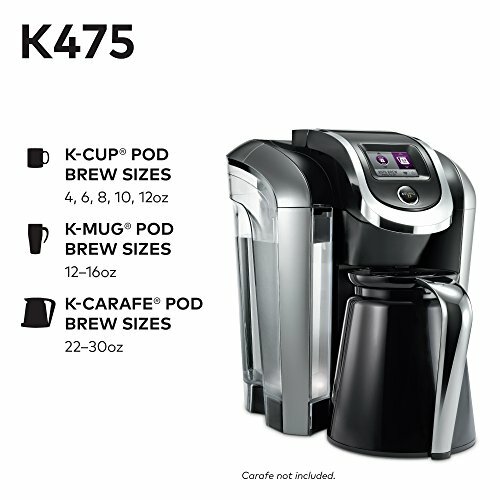 For those people who drink a lot of coffee or those who don’t like the idea of disposable pods or having to refill reusable pods, the K475 may not be the ideal brewer. What do you think? 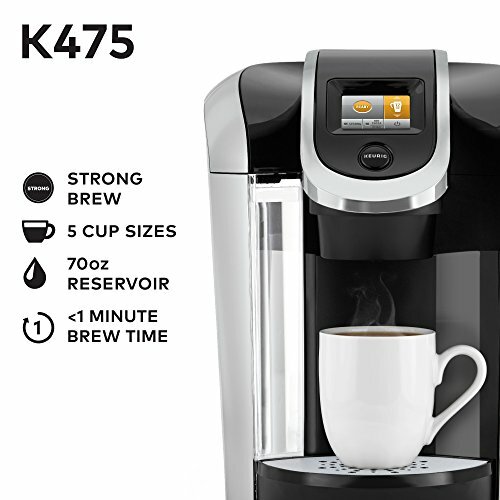 Let us know in the comments if you’ve purchased a Keurig K475 and what you think of it. If have experience with other models, we’re looking forward to hearing your thoughts.